For those of you that know me, you will perhaps know that I don’t have much of a sweet tooth. However, I do absolutely love chocolate truffles as they are not sickly but more bitter sweet. These are the types of sweets I really enjoy. I couldn’t really decide on any particular flavour to go with. I had several ideas lurking in my mind like Orange Blossom Flower and Pistachios, Chile and Vodka, Rum and Coconut, Brandy and Ginger, and simply just Brandy. So, I decided I would go with all of them. After all these will be gifted and the more choices the more chances friends and family will enjoy it. 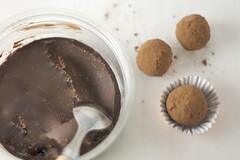 Chocolate truffles are extremely easy and simple to make. They are also so versatile and the limit for flavour combinations is your own imagination. These luscious, silky-smooth bites of heaven are made using a basic ganache or a mixture of high quality chocolate and heavy cream. For truffles I use half the amount of cream to chocolate. Chocolate truffles can be left in the fridge for a couple of weeks or even frozen for a month or so. The idea of infusing chile into the cream came after spotting a chocolate bar somewhere a while ago. I didn’t try it but nevertheless the idea stuck. I wanted to test it out as I was very intrigued by the flavour combination. I am happy I did. The chile-vodka combination really provides for a generous kick and a nice surprise. Update- I took these to a Christmas party and they caused a huge hype! I left with two orders for them; one of them for a big upcoming wedding. Give them a try and you’ll surely win over some hearts! Slice the chili open and remove the seeds. Add it to 50ml of the whipping cream and bring to a simmer, stirring often. Turn off flame and let it sit to infuse the chili flavour. Take the remaining 200ml of heavy whipping cream and bring to a simmer. While the whipping cream is coming to a simmer, put the chocolate in a food processor and blitz till you get small, even pieces. Alternatively, you can just chop them up. Remove 100g of this chocolate and reserve for the chili batch. Take the remaining 400g and place in a bowl, and then pour over the hot double cream. Stir well until it is all incorporated. Now, divide this batch evenly into 4 separate bowls. Now flavour each bowl accordingly: Add a tablespoon of rum to one, orange blossom to another, and brandy to the other two. Mix well. Don’t forget to keep in mind which one is which- you can always taste. Add the chopped crystallised ginger into one of the bowls that has had brandy added. Mix well. Now go back to the chili cream. It might need to be reheated just a tad at this stage. Remember to stir well. Take the chocolate that has been set aside, place in a bowl and cover with the hot cream. Mix well until all is incorporated. Next add a tablespoon of vodka and mix well. Allow the mixtures to cool, then cover and label all the bowls. Place in the fridge to set for a couple of hours or overnight. Remove from the fridge and using a teaspoon, roll out balls of the chocolate ganache mixture. Shape them into nice round balls by rolling them in the palms of your hands. Do this as quickly as possible otherwise they will melt from your body heat. If you are serving immediately then roll them in the applicable coatings. Otherwise, it is best to place them on a lined baking sheet in the fridge till you are ready to serve. The plain brandy ganache, the brandy ginger ganache and the chile ganache with a cocoa powder. what a wonderful post, the photos are beautifully styled and the instructions make truffles an easy and accessible recipe for anyone. especially for those of us who DO have a sweet tooth! your family and friends are in for a treat. it will certainly be a delicious holiday for them! YES!.. Chocolate truffles…i hope i get some for Christmas. The photos are as ever amazing! 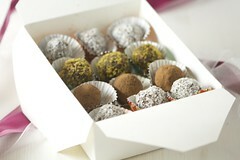 Mmm yummy, truffles make fabulous home made presents and I love the one rolled in chopped pistachio. Beth these look amazing. Perfect for Christmas. Great process photos! I’ve tried to make truffles before, and they kept melting in my hand. I just gave up and used the ganache for something else. I’ll have to try this again with a small scoop or something. I don’t know. It’s the only dish I’ve wanted to make that I’ve been unsuccessful at making. 🙁 it’s funny that you call it easy haha. Because of my hot hands, it isn’t so easy for me. I absolutely LOVE those teacups!! Where are they from – and please don’t say they are vintage and therefore i will never have the chance to find my own set!! Beautiful truffles – they will make a lovely prezzies! Honestly – I need those teacups! Memoria- You know what I also find helpful is to wipe your hands with a paper towel every now and then. Beauty….at its peak. I am a chilli truffle lover…. Chilies! What a cool idea; makes perfect sense. Thanks! Your truffles, especially the orange blossom flower and pistachio – looks so good. I think they would definitely make a perfect Christmas giveaway! Oh Beth, thank you, thank you! This is exactly the inspiration I needed! I no longer have to worry about christmas presents! No really, I mean it! Time slipped through my fingers somehow and I still don’t have presents. First I was just joking about cooking something for everybody. But now, it’s a very convenient idea indeed! 🙂 I wonder if my family and friends will like it. These truffles look amazing, I would enjoy every single flavour. Utterly beautiful Beth, what a gorgeous selection of flavours. I don’t have much of a sweet tooth either, so these look absolutely perfect for me. Oh, and Nick would just love the chile-infused one! Too gorgeous.